This is part 18 of Categories for Programmers. Previously: It’s All About Morphisms. See the Table of Contents. In mathematics we have various ways of saying that one thing is like another. The strictest is equality. Two things are equal if there is no way to distinguish one from another. One can be substituted for the other in every imaginable context. 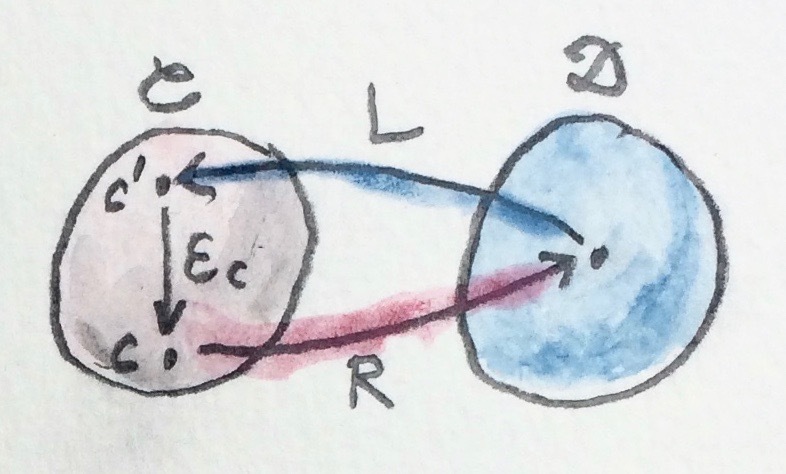 For instance, did you notice that we used equality of morphisms every time we talked about commuting diagrams? That’s because morphisms form a set (hom-set) and set elements can be compared for equality. swap happens to be its own inverse. When we talk about categories being isomorphic, we express this in terms of mappings between categories, a.k.a. functors. We would like to be able to say that two categories C and D are isomorphic if there exists a functor R (“right”) from C to D, which is invertible. In other words, there exists another functor L (“left”) from D back to C which, when composed with R, is equal to the identity functor I. 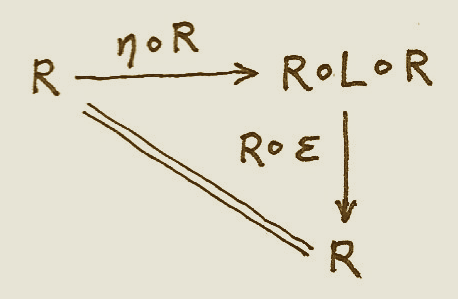 There are two possible compositions, R ∘ L and L ∘ R; and two possible identity functors: one in C and another in D.
You might argue that functors are morphisms in the category of categories, so they should be equality-comparable. And indeed, as long as we are talking about small categories, where objects form a set, we can indeed use the equality of elements of a set to equality-compare objects. But, remember, Cat is really a 2-category. Hom-sets in a 2-category have additional structure — there are 2-morphisms acting between 1-morphisms. In Cat, 1-morphisms are functors, and 2-morphisms are natural transformations. So it’s more natural (can’t avoid this pun!) to consider natural isomorphisms as substitutes for equality when talking about functors. So, instead of isomorphism of categories, it makes sense to consider a more general notion of equivalence. 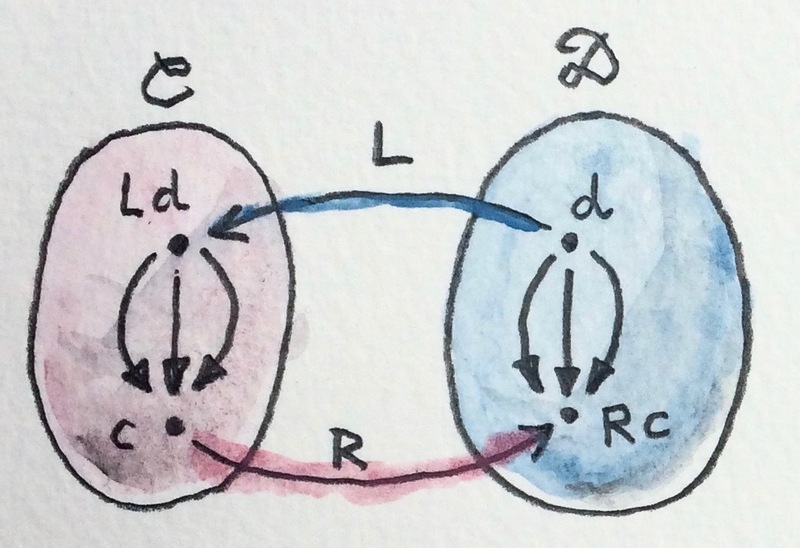 Two categories C and D are equivalent if we can find two functors going back and forth between them, whose composition (either way) is naturally isomorphic to the identity functor. In other words, there is a two-way natural transformation between the composition R ∘ L and the identity functor ID, and another between L ∘ R and the identity functor IC. η is called the unit, and ε the counit of the adjunction. To better understand the adjunction, let’s analyze the unit and the counit in more detail. 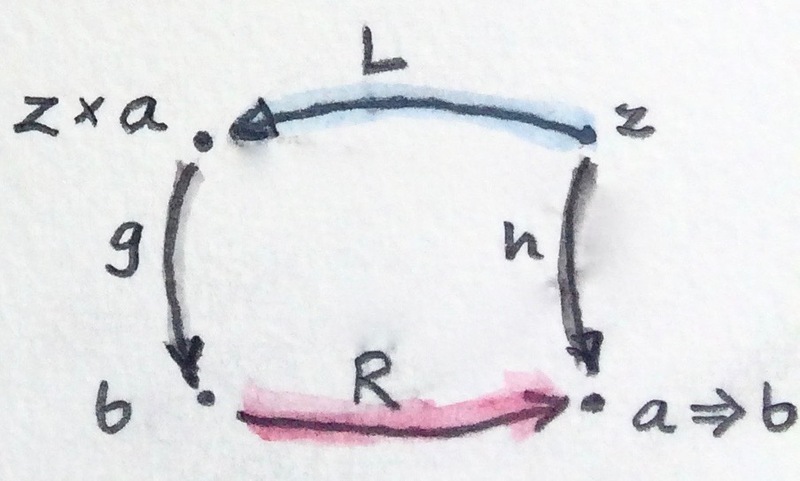 Notice that the composition R∘L is an endofunctor in D.
This equation tells us that we can pick any object d in D as our starting point, and use the round trip functor R ∘ L to pick our target object d'. Then we shoot an arrow — the morphism ηd — to our target. 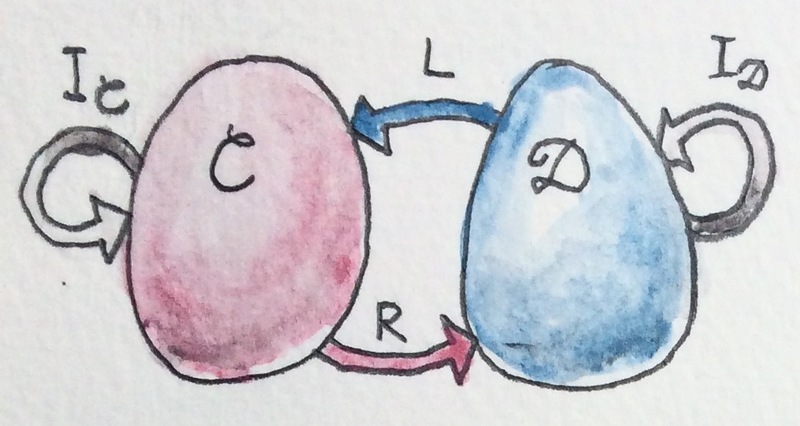 It tells us that we can pick any object c in C as our target, and use the round trip functor L ∘ R to pick the source c' = (L ∘ R) c. Then we shoot the arrow — the morphism εc — from the source to the target. 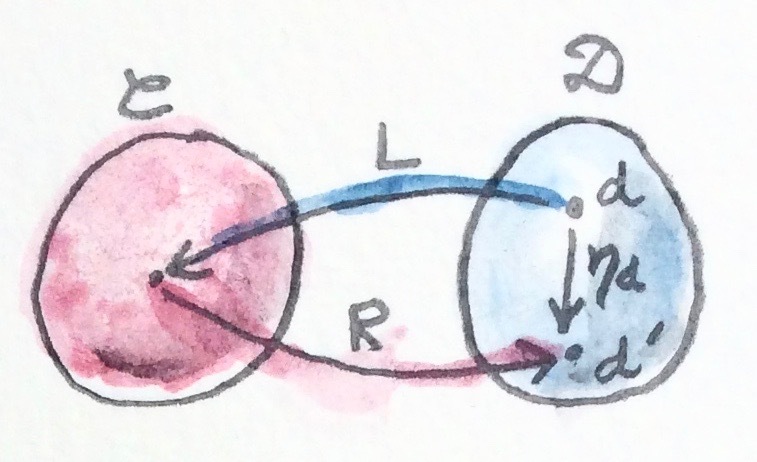 Here, m is the (endo-) functor corresponding to R∘L, and w is the (endo-) functor corresponding to L∘R. As we’ll see later, they are part of the definition of a monad and a comonad, respectively. If you think of an endofunctor as a container, the unit (or return) is a polymorphic function that creates a default box around a value of arbitrary type. The counit (or extract) does the reverse: it retrieves or produces a single value from a container. We’ll see later that every pair of adjoint functors defines a monad and a comonad. Conversely, every monad or comonad may be factorized into a pair of adjoint functors — this factorization is not unique, though. In Haskell, we use monads a lot, but only rarely factorize them into pairs of adjoint functors, primarily because those functors would normally take us out of Hask. This definition requires some explanation. First of all, it describes a multi-parameter type class — the two parameters being f and u. It establishes a relation called Adjunction between these two type constructors. Additional conditions, after the vertical bar, specify functional dependencies. For instance, f -> u means that u is determined by f (the relation between f and u is a function, here on type constructors). Conversely, u -> f means that, if we know u, then f is uniquely determined. I’ll explain in a moment why, in Haskell, we can impose the condition that the right adjoint u be a representable functor. Furthermore, factorization can be often described in terms of natural transformations. Factorization involves commuting diagrams — some morphism being equal to a composition of two morphisms (factors). A natural transformation maps morphisms to commuting diagrams. So, in a universal construction, we go from a morphism to a commuting diagram, and then to a unique morphism. We end up with a mapping from morphism to morphism, or from one hom-set to another (usually in different categories). If this mapping is invertible, and if it can be naturally extended across all hom-sets, we have an adjunction. The main difference between universal constructions and adjunctions is that the latter are defined globally — for all hom-sets. For instance, using a universal construction you can define a product of two select objects, even if it doesn’t exist for any other pair of objects in that category. As we’ll see soon, if the product of any pair of objects exists in a category, it can be also defined through an adjunction. that is natural both in d and c.
Both natural transformations must be invertible. We get a family of morphisms parameterized by d. They form a natural transformation between the functor I and the functor R ∘ L (the naturality condition is easy to verify). This is exactly our unit, η.
Conversely, starting from the existence of the unit and co-unit, we can define the transformations between hom-sets. For instance, let’s pick an arbitrary morphism f in the hom-set C(L d, c). We want to define a φ that, acting on f, produces a morphism in D(d, R c). There isn’t really much choice. One thing we can try is to lift f using R. That will produce a morphism R f from R (L d) to R c — a morphism that’s an element of D((R ∘ L) d, R c). The other direction is analogous, and so is the derivation of ψ.
It’s very instructive to follow the translation from the categorical description of the adjunction to Haskell code. I highly encourage this as an exercise. We are now ready to explain why, in Haskell, the right adjoint is automatically a representable functor. The reason for this is that, to the first approximation, we can treat the category of Haskell types as the category of sets. which shows that R is indeed representable. We have previously introduced several concepts using universal constructions. Many of those concepts, when defined globally, are easier to express using adjunctions. The simplest non-trivial example is that of the product. The gist of the universal construction of the product is the ability to factorize any product-like candidate through the universal product. More precisely, the product of two objects a and b is the object (a × b) (or (a, b) in the Haskell notation) equipped with two morphisms fst and snd such that, for any other candidate c equipped with two morphisms p::c->a and q::c->b, there exists a unique morphism m::c->(a, b) that factorizes p and q through fst and snd. We have a mapping that takes a pair of morphisms p and q and produces another morphism m = factorizer p q. How can we translate this into a mapping between two hom-sets that we need to define an adjunction? The trick is to go outside of Hask and treat the pair of morphisms as a single morphism in the product category. Let me remind you what a product category is. Take two arbitrary categories C and D. The objects in the product category C×D are pairs of objects, one from C and one from D. The morphisms are pairs of morphisms, one from C and one from D.
To define a product in some category C, we should start with the product category C×C. Pairs of morphism from C are single morphisms in the product category C×C. It might be a little confusing at first that we are using a product category to define a product. These are, however, very different products. We don’t need a universal construction to define a product category. All we need is the notion of a pair of objects and a pair of morphisms. However, a pair of objects from C is not an object in C. It’s an object in a different category, C×C. 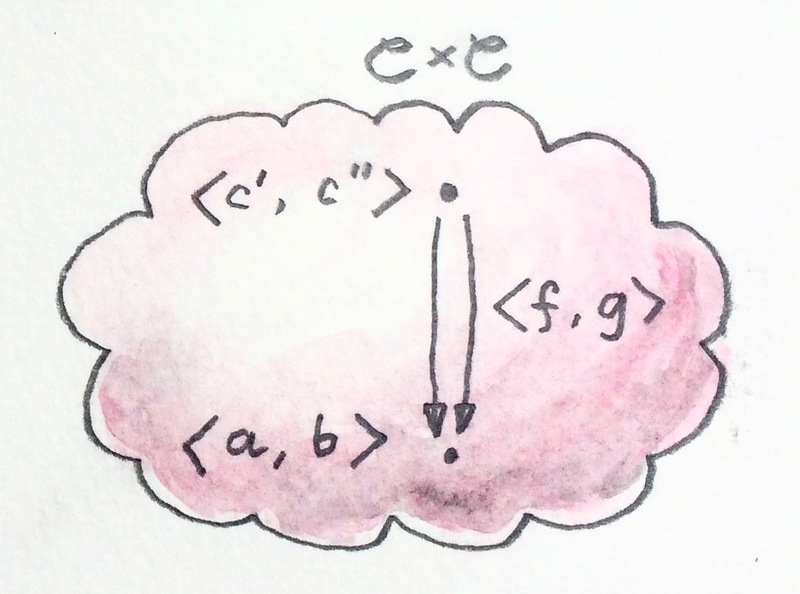 We can write the pair formally as <a, b>, where a and b are objects of C. The universal construction, on the other hand, is necessary in order to define the object a×b (or (a, b) in Haskell), which is an object in the same category C. This object is supposed to represent the pair <a, b> in a way specified by the universal construction. It doesn’t always exist and, even if it exists for some, might not exist for other pairs of objects in C.
If that mapping exists, we conclude that there exists the right adjoint to the diagonal functor. 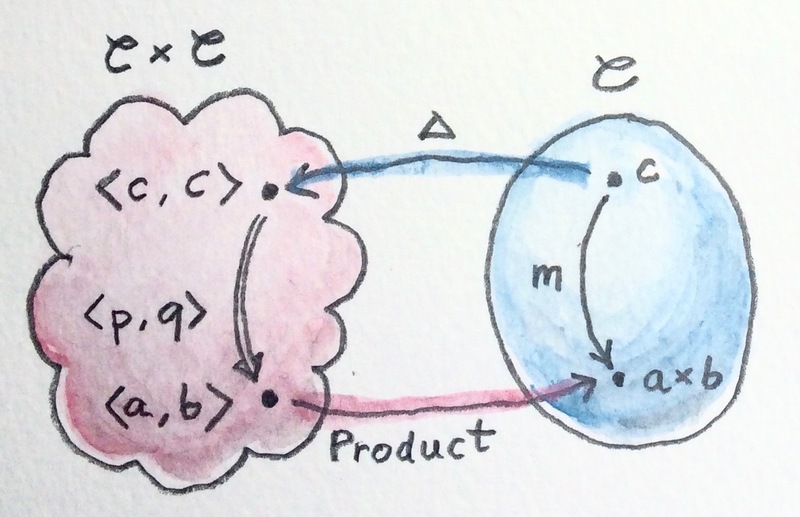 That functor defines a product. In Haskell, we can always construct the inverse of the factorizer by composing m with, respectively, fst and snd. To complete the proof of the equivalence of the two ways of defining a product we also need to show that the mapping between hom-sets is natural in a, b, and c. I will leave this as an exercise for the dedicated reader. This statement establishes a mapping between hom-sets. In this case, we are dealing with objects in the same category, so the two adjoint functors are endofunctors. The left (endo-)functor L, when acting on object z, produces z × a. It’s a functor that corresponds to taking a product with some fixed a. The mapping of hom-sets that underlies this adjunction is best seen by redrawing the diagram that we used in the universal construction. I have previously mentioned that a universal construction defines a unique object, up to isomorphism. That’s why we have “the” product and “the” exponential. This property translates to adjunctions as well: if a functor has an adjoint, this adjoint is unique up to isomorphism. Derive the counit ε starting from the hom-sets isomorphism in the second definition of the adjunction. Complete the proof of equivalence of the two definitions of the adjunction. Show that the coproduct can be defined by an adjunction. Start with the definition of the factorizer for a coproduct. Show that the coproduct is the left adjoint of the diagonal functor. Define the adjunction between a product and a function object in Haskell. I’d like to thank Edward Kmett and Gershom Bazerman for checking my math and logic, and André van Meulebrouck, who has been volunteering his editing help throughout this series of posts. I was just studying adjunctions for my Category Theory class and thought of writing an e-mail to ask you about it. Came to check your website and BAM! Amazing. I appreciate your work so much and can’t wait for the remaining parts! I’ve seen a Russian translation of the first few installments of the book. Are we talking of a translation in the blog form? If so, feel free as long as you provide links back to the original. What language? French? The translation would be in French. I was thinking to put it on a french website where there are a lot of tutorials, mostly about IT : http://www.zestedesavoir.com . Here is an example of a tutorial : https://zestedesavoir.com/tutoriels/674/apprenez-la-programmation-fonctionnelle-avec-haskell/ . Thank you so much… I have just finished reading all the chapters until now. I haven’t studied maths since I left uni, and it has been a real pleasure reading this blog. Smooth and simple. This is really valuable for me and I am sure, a lot of devs will find it very useful. Thanks again. Can’t wait for the next chapters! So, in a not locally small category, in which hom-sets are not sent, can’t we form commuting diagrams? How can we define then associativity and identity? @Juan Manuel: Yes, it’s tricky! The idea is that you replace hom-sets with objects from some category. You work with a category that’s “enriched” over a base category. That base category has hom-sets, so you can form commuting diagrams in it. That way you always bottom up at sets, but you postpone it as much as possible. Sets give you comparison because sets are all about membership and to answer to membership questions you need equal comparison between elements. So if you have sets of morphisms (hom-sets) you can form commuting diagrams because morphisms are comparable. If you don’t, you have hom-objects in an enriched category. Then you need to compare objects but, to do it, if this enriched category is small, you can compare the hom-sets of the hom-objects and, if they are equal, both objects are equal, aren’t they? It’s kind of definim equals on lists using equals on the elements of lists. You’re on the right track, except that you never want to compare objects for equality. You formulate all laws as commutative diagrams in the base category. Have a look at my post about impoverished categories. a typo: “The main difference between universal constructions and adjunctions it that the latter are defined globally” should be “is that” ? At the triangular identities: “the arrows are natural transformations, and their composition is the horizontal composition” – shouldn’t it be vertical composition? Vertical composition is for natural transformation between three functors that all share the common source and the common target category. Here we compose, for instance, L after η. L stands for identity natural transformation from L to L, a functor that goes from D to C. η is a natural transformation from ID to R∘L, both going from D to D. So we go horizontally, first from D to D and then from D to C.
R εc ∘ η R c = id R c ?? I think the diagrams commute have some mistake. L (R c) -> c and c -> L (R c) are not the same. I made some changes. Does it make sense now? Remember that ε and η have to satisfy naturality conditions. In your example, this only works when the arrows are the inverse of each other (1->2 being the inverse of 2->1, and so on). Two ε are equal and satisfy naturality conditions. 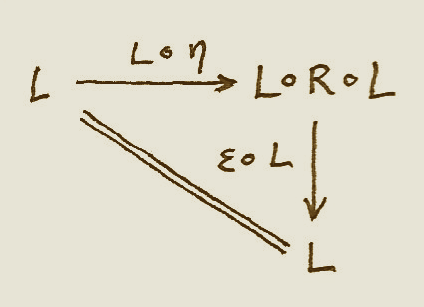 For example : (L (R 1)) = 2 then ε 2 = 1 .
ε is decided by L∘R . ε is always equal and don’t need inverse of each other. Correct. I should probably clarify this in the text. Consistent with the notation I used elsewhere, the middle dot should be solid. Derived (similarly to φ): ψ g = ε c ∘ L g.
But we don’t, in general, have the notion of object equality in an arbitrary category. Could you please elaborate a little bit what do you mean by that? In an arbitrary category we need equality for objects in order to compose morphisms. We can compose g ∘ f iff dom(g) = cod(f), where dom(g) and cod(f) are objects. These objects might represent some mathematical constructs with a vague notion of equality, but it has to be well-defined the moment we start talking about objects in a category. I guess, in general, we don’t have the notion of morphism equality in an arbitrary category though, and that’s the reason we cannot define functor equality in terms of equality of objects and morphisms. This is one of these tricky foundational questions that I tried to avoid. Strictly speaking there are two different definition of a category, depending on whether you consider one big collection of morphisms together with the source and target mappings to objects, or a separate collection of morphisms for every pair of objects (the hom-set) and a mapping between pairs of hom-sets as composition. Even if you take the first definition (which is what you’re considering), there are different ways of understanding the equality of objects. There is the definitional equality, as “literally the same object” and there is the propositional equality that requires a proof. If you have two different functors mapping the same object, you need a proof that the target objects are equal. If you want to dive deeper into this topic, here’s a good starting point: https://ncatlab.org/nlab/show/principle+of+equivalence . Thanks, I think I understand now what you mean. But I still struggle understanding if we need the notion of object equality for definitions of id and ∘. To me it seems like we need it in both definitions of a category that you mentioned. We just might want to relax or completely avoid the notion for other definitions, like in the case of functors equality, as it would unnecessarily inflict proving that involved objects are the same. In other words it seems like we still have the notion, even though arbitrary category for any pair of objects we cannot prove the equality. Thanks for your effort explaining the material! What are adjunctive squares? Would they be helpful to show for example the commutativity found in universal construction definition of the product? I found that it’s not very obvious from the adjuction definition (for the product). I found it in some papers. Something like this for product. I don’t know why it seemed clearer.